Below is a multi-part article I wrote for the NMGRR newsletter. I will post the latest portion each month as the work progresses. Normally I post newest items at the top but to keep everything in the correct chronological order new installments are posted at the bottom. Some editing has been done to fit the website format. According to the little known and seldom acknowledged locomotive Zodiac, 2015 is the year of track. Some of us are expanding our layout; others fixing problems on existing track and a few are facing the start of their railroad empire from the beginning. No matter where you are at, to make progress you have to do the work. To be fair I have tried a few other methods, wishing it complete on my birthday cake, wishing it complete on Carlene’s birthday cake and threatening the yard gnomes union with reprisal if they did not build it. None of these worked and I am now forced to accept that the only way to build the layout is to do it myself. Oh those stupid garden gnomes will know my wrath…. Getting started is hard. Even looking at the list is overwhelming. 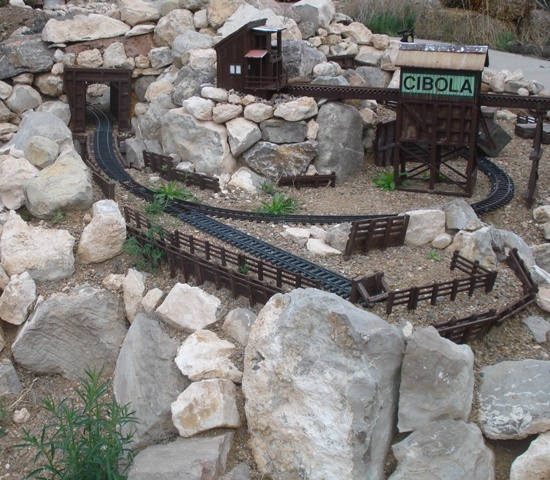 Large amounts of rock and dirt must be moved to expand the yard at Cibola and to form the right of way (ROW) for the branch line. The existing track needs weeding, leveling and to be re-ballasted. Then there are all of those buildings wanting a fresh coat of paint as well as new ones that want to be built. I need to install ground throws. Plant the garden. Water the trees. Fix the toilet. Feed the cat….ARGHHHH!!! It is too much for my monkey brain to deal with. So how do we get our 45mm monsters under control and allow us to enjoy that dream layout? I basically have two problems inhibiting me. The first is lack of experience. I seldom know what I am doing or how to do it until the project is underway. This should explain why I am redesigning the yard at Cibola for the third time in as many years. The second problem is a little more complicated. I suffer from severe depression along with a variety of other mental illnesses, some of which the doctors don’t even have names for yet. 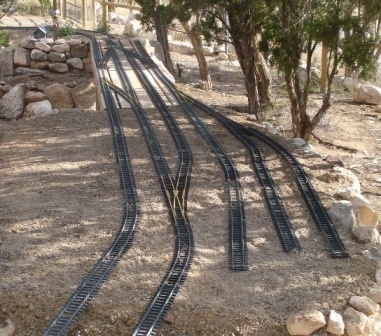 It has even occurred to me that Garden Railroading is just part of a giant covert government experiment to test how well my monkey brain deals with stress. So here I am with shovel and brass rail in hand and some kind of plan which I am clearly making up on a steep learning curve. 2. Prepare your work space. I cannot function in a cluttered area, even if it is cluttered with my train stuff. Clearing off everything I am not using right away helps me focus on what I am doing. I am not saying go out and redesign the entire shop or even clean the whole thing up for the first time in twenty years. We are looking for a few square feet to repair a switch or room to cut track, maybe even construct a bridge. I cleared off most of my construction bench and part of my painting bench in preparation. The worst transgressions in these spaces are the tendency to use them for storage. Either tools or supplies, at any given time of year my working area is doubling as shelf space. The only way to solve this will be a redesign of the shelving in the shop but that will have to wait. I must keep focus on this year’s subject; track. 3. Schedule your hobby time. You cannot wait for time to open up, put your work time on the calendar along with the goal for that session. This is where you have to summon your resolve. Everybody has one evening or a few hours on a weekend. If you have to, get up early Saturday morning or turn off the TV on Tuesday night ignoring Dateline and leave the kids to do their own homework. You survived algebra they will to. Set reasonable goals for each session. You might be able to pull weeds on the entire layout in a single shot but don’t try to do too much. Over reaching will result in a poor job and most likely dampen your motivation if you don’t reach the goal. At the very least you run the risk of turning your hobby into a job. With the prep work done it is time to do the deed. If you are just starting on your layout go down to Home Depot and get a bundle of those little orange flags on wire stems. Then go outside, dream big, and start marking the ROW. For those of us that have an existing layout here is the list of spring time jobs that seem to show up every year. I suggest starting with these. • Pull weeds. We have had some rain this month and if you do not get on these now they will sink roots to China and you will need a backhoe to get them out. Once the weeds are removed I use ground killer on the ROW. I don’t like using poisons and try to avoid putting anything on the rest of the layout. Still there are times when I have to go scorched earth. • Prune or remove trees and shrubbery. Here in the East Mountains I follow the Forestry services guidelines for undergrowth. We keep all the trees trimmed to about four feet above the ground. All dead material is removed from the previous year’s flowers, grass and any large annuals. This is also a good time to pull out cactus. • Inspect and repair damaged track and switches. I always look for tie strips with missing tie plates or where the rail has pulled out of the strip. On rare occasion I have found bent rail where a large animal or small child stepped on it. I have never found an acceptable way to fix a vertical bend in rail so these areas have to be cut out or the section replaced entirely. Check switches for easy movement of the points and to insure the flange-ways are not full of dirt, rocks or twigs. If you are running DCC or straight track power tighten your clamps and joiners, even if you have continuity. My goal with track is to always have the trains running smoothly, not constantly fixing small problems as they occur. This is crucial to enjoying the hobby, as my interest in maintenance drops as the year progresses. All I want to do by July is run trains and eat BBQ. • Level and ballast track as needed. This is probably the easiest job I do every year. Using a five foot long level and a couple of wooden blocks I crawl around the track checking it for level or at least a steady grade. A six inch torpedo level is used for side to side. The wood blocks are laid across the rails four feet apart and then the level is placed on top. This lets me look at the grade over a longer distance. I slide wood door shims under the track to raise it to where I want and then move down the rail. When I am done I pour ballast (crusher fines) over the track and sweep it with an old broom to settle it between the ties. The wedges are removed as I go along. • Repair trestles, cribs and bridges. These are usually durable and do not need much attention. I paint mine with Rustoleum brown oil base paint but if you use wood sealer you may need to coat them once or twice a year. Being on a hillside washouts around the bents is the most common problem. At this point you should be able to run a train. I recommend doing so as soon as possible. I started my year of track in January because of the great weather we had. Lots of dirt and rock were moved in preparation for the branch-line. I also extended the area for the town of Cibola. This let me make the changes to the yard that I needed. Faith may move a mountain but I used a shovel and a fireman’s pike. Closing the gap over the arroyo necessitated a change in the length of the bridge required. To this point I have used pieces of 2 X 4 temporarily but I went against my own advice and decided to interrupt my track clean up to build the through truss bridges for this area. As you can see from the pictures they look great but it diverted my effort for two weeks. I lost momentum on the cleanup and should have stuck to my schedule. I could have been running trains while waiting for glue and paint to dry on the bridges. Lesson learned. 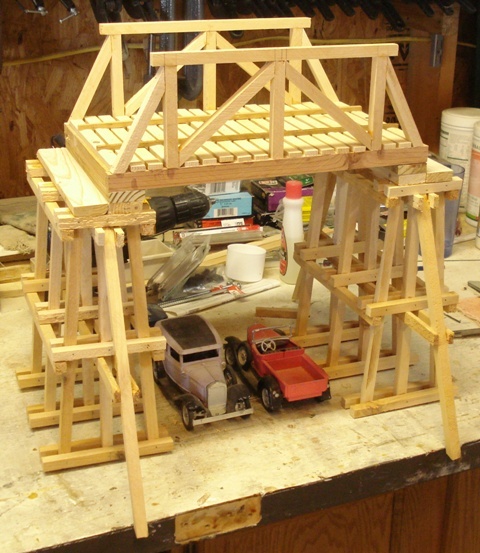 A detailed build log is posted in the bridge section under track. It is time to follow along with the year of track. Go get your hands dirty. Lay some track. 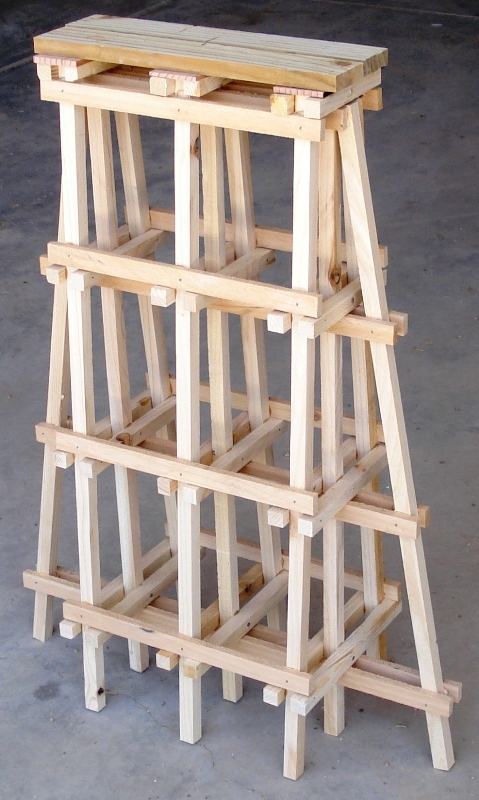 Build some trestles. Learn a few new curse words. Next month on “The Year of Track” I will share the planning along with the many pleasures of preparing roadbed for the branch-line by moving rocks and dirt. Now I think I will go rest my monkey brain. There is one indisputable truth of laying track: You will earn every inch of your Right Of Way (ROW). What you pay for it in back aches, blisters and muscle cramps is determined by how much effort is required to construct it. The ROW is composed of three parts; the sub-roadbed, the roadbed and the ballast. 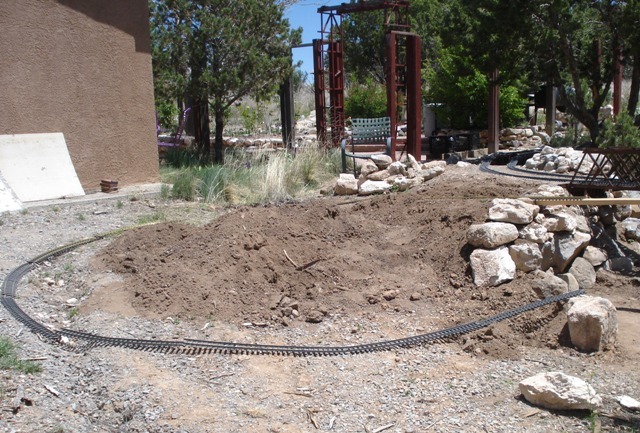 Since this is the most physically demanding part of Garden Railroading you will want to get it right the first time or as close as you can come. Keep in mind. If you have access to your layout for a backhoe or bobcat I suggest using one to build the sub-roadbed. This is not an article on track planning but I would point out that you need one. It does not have to be overly detailed but some idea of where track can be run and how you want it to look is very helpful. I recommend including a few basic features if possible. The first is a loading or yard table. This is a section of track close enough to the edge so that you can reach it without leaning over. It should be at least ten feet long and waist high. The value of this becomes immediately evident once you have squatted to ground level to place rolling stock and engines on the track for the hundredth time. You may also want a passing siding and two or three stubs for operations or staging trains for an open house. Here is the plan I did for the branch line edition. Even though it is not to scale and does not calculate curve radius having it has helped tremendously with placing the sub-roadbed. The black lines are the parts that are complete while the red lines are the parts under construction. Enough advise. From now on things are going to get evil. 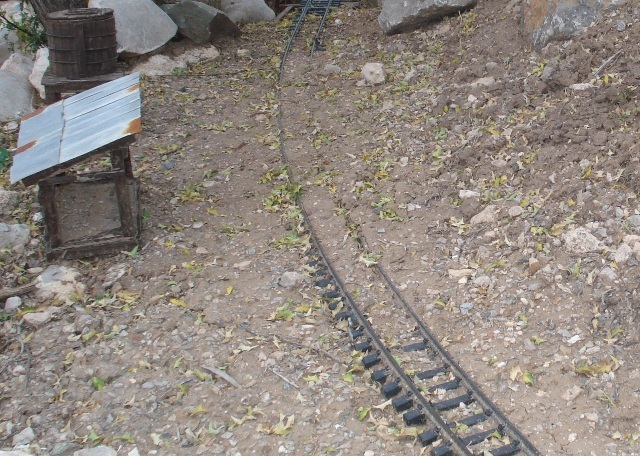 The sub-roadbed is a layer of rocks and dirt that holds your track in place. 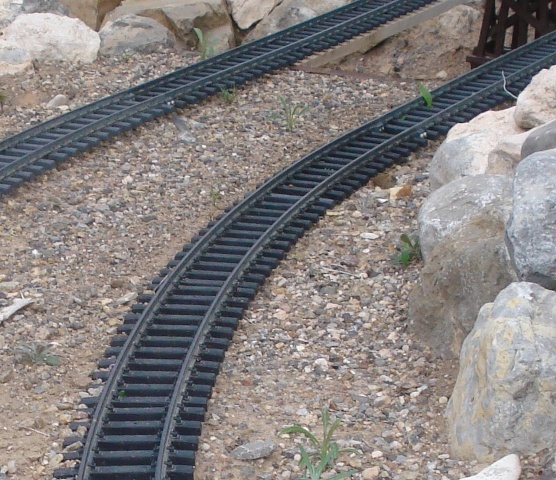 It can be a few inches to several feet thick depending on what kind of grade you need or the slope of your layout. I am on a hillside where the elevation falls four feet from back to front. Since I wanted the grade of the mainline to be 1% (elevation change of 1” in ten feet) or less I had to do considerable cut and fill. For the branch-line I will be dealing with grades of 2 – 4% with these beginning at the height of the raised portion. A lot of material will have to be moved to accommodate this. Since my sub-roadbed is composed of loam, sand and gravel I will need something to hold it in place. I happen to have an abundance of shattered granite so I will be using stacked rock. Other things can and have been used by our members. Mike Mitchell and Joe Semler both used crossties, Lonnie Brandenburg has recycled plastic playground liners and Wynn Erdman went all out with custom poured and sculpted concrete cliff faces. All of these work great and all are labor intensive to work with. The good news is that once you are done with this phase, building the rest of the ROW gets easier fast. For my own personnel misery I have to build four different sections to complete the branch-line. The first is North Mountain. I think of it as the downhill side even though engines can run either direction on the loop. This circle back is on the North end of the layout and begins where the branch-line crosses the Cibola arroyo next to the quadrangular bridges. There is not a lot of room here so the grade will be close to 4% or a little more. Complications in this area include drainage from the rear patio of the house, the construction of two tunnels and the fact that all materials must be hauled uphill for placement. 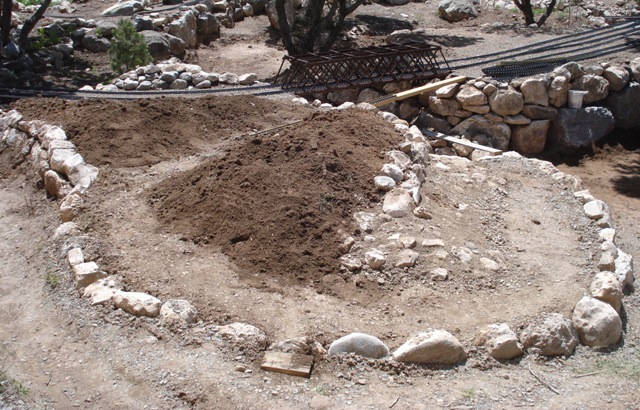 In the picture below you see the start of the dirt pile and the initial placement of the rocks. The second area is Copes Yard. It occupies the center of the layout. This will include a passing siding and three stubs for local industry. It is the longest run of track in the branch-line and is mostly flat. I actually started on this section in February by digging and forming the lower half of the Rio Oso. 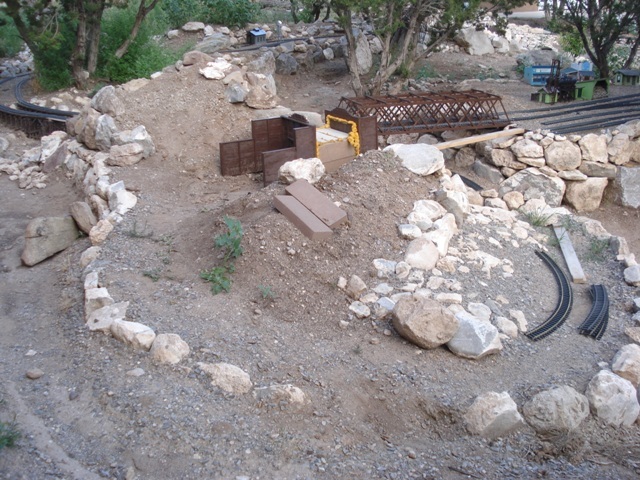 The top part was done last year as part of the A-frame bridge install and the creation of the town site for Broken Wheel. To get dirt for the fill I dug out the area on the back side of the loading table and formed a ravine along the rear of the Cibola town site. 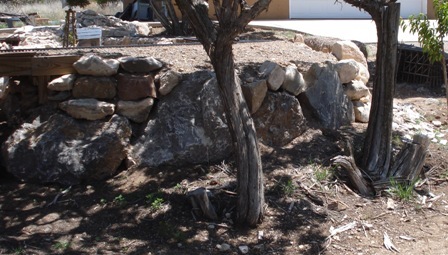 All of those rocks in the photograph were buried in the soil here. I have been fortunate that the cool weather and rain have kept the soil damp and loose. If we were having a typical dry spring this area would be like chiseling concrete. 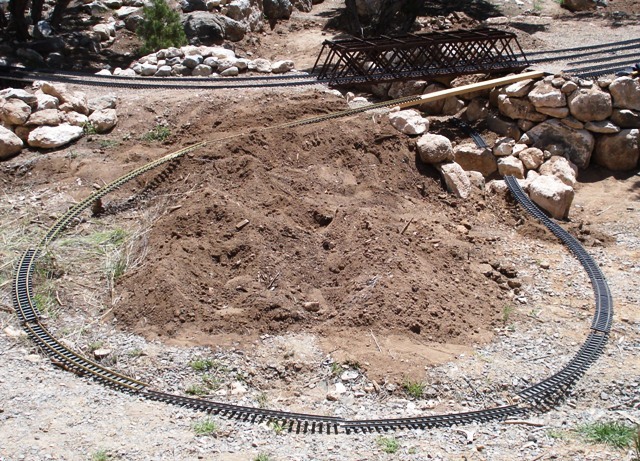 A lot of scenery work will be done inside the layout once the track is in. Included will be a walking path as operation of the switches is by manual ground throws. Anybody switching on the branch-line will be able to reach all of the throws from the interior without too much effort. The third area is the Upper Antelope Valley Pass. It should be the easiest as it involves the least amount of dirt and rock movement. The line comes under the loading table on the South end and curves around the mountain in a series of alternating trestles and fills. I am debating another short tunnel in this area. I will wait and see what my level of tolerance for pain is when I get to this section. 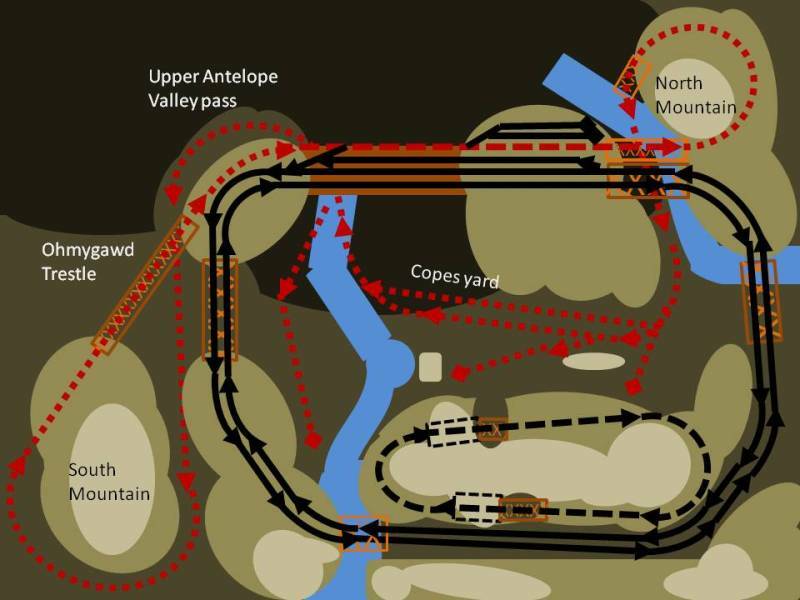 The last area is South Mountain which makes the climb up hill to Ohmygawd trestle. I hope to keep this bit of track under 2%. 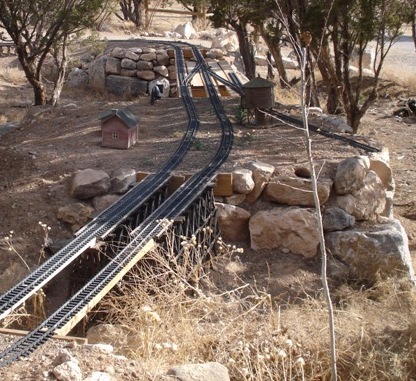 As the track comes around the mountain it crosses under the bridge at the top of Ohmygawd trestle and loops around the tree at the extreme South end of the layout. A lot of this dirt work is done. The tough part will be installing the fifteen foot long trestle. I think I have enough of the pieces Rolfe Black gave me to complete the entire thing. At the time I could not imagine ever using it all. Now I wish I had accepted his offer of the other pieces. Lesson here, never turn down free trestle. I am now working on getting all of the dirt and supporting rocks in place. The sub-roadbed is only leveled within an inch or two of the grade. There is no use in spending a lot of time on it as three to five inches of roadbed comes next. I am using engineering fill as roadbed as it compacts well and firms up after it sits for a while. I find this helps shed water without creating washouts. I am disappointed to report that no roadbed was laid this month. According to the gonkulator on the wall summer has arrived here in the East Mountains. Temps are now reaching into the 90s every day with little or no cloud cover. Being a creature of the shadows Boomer is now banished from the railroad by 9:00 AM most days. I knew this was going to happen and actually expected it by late April. Having had one of the coolest and wettest springs on record I have no complaints. Still it means that progress on the branch-line is slowed to a crawl. In an effort to continue forward progress I have retreated to the garage to build the wooden items I will need to complete the ROW. Tunnels: There are two tunnels in need of portals on the layout. I decided the two for the branch-line would be made of wood. 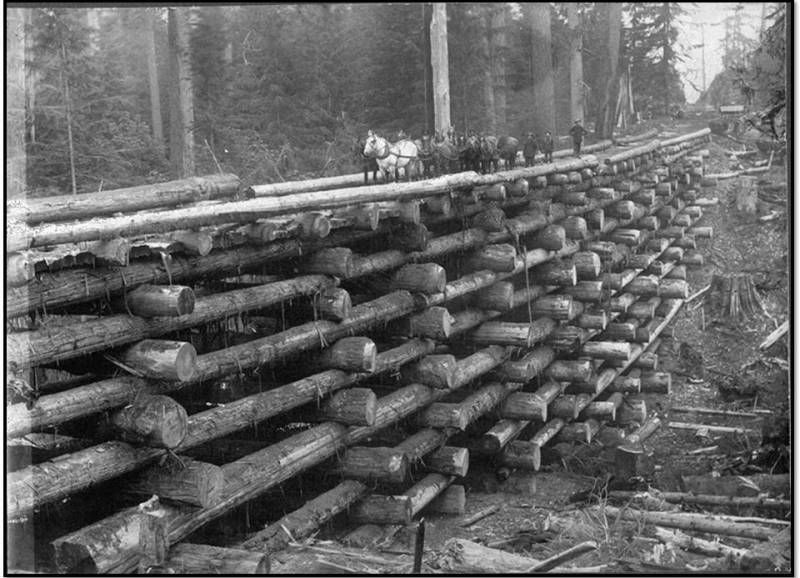 These are typical of early railroading design which was very common on logging and other short lines. They are expedient and used readily available materials. Supports consisted of a wood sheath held in place against the earth wall by columns and headers. On the prototype this was good for a few months or even years. If the tunnel remained in service for longer periods it would be lined with bricks using an arch support and keystone. To reflect the all wood design l built these single track portals with heavy timbers. In the picture you can see the edge of the wood sheathing protruding past the columns on each side and above the header across the top. These supports would run through the length of the tunnel but I only made the last ones visible on each end. The bricks that line the tunnel are painted black and not overly visible from the edge of the layout. The portals for the double track main are the brick and stone kind. 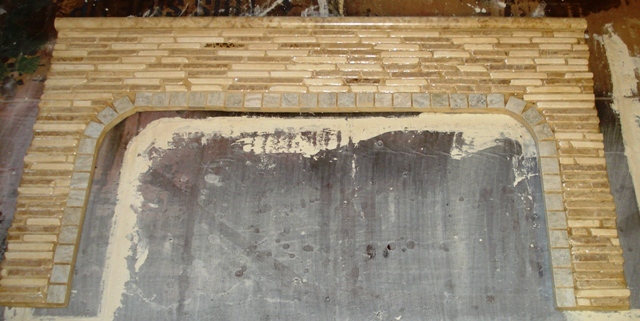 These were made using pieces of ornamental tile glued to Hardybacker and then mortared with non-sanded grout. The completed portal is then glued to the bricks that form the tunnel liner. 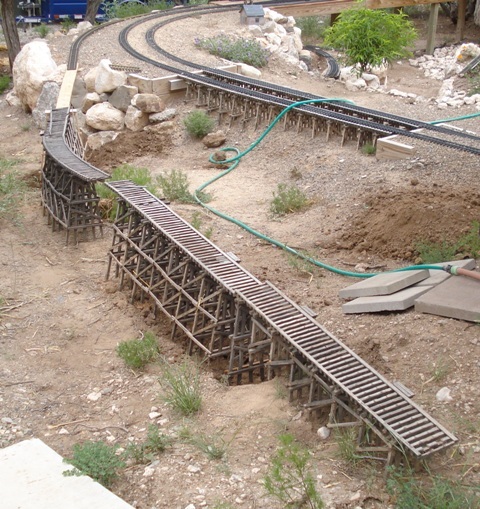 Trestles: The largest wood construction on the layout by no surprise is Ohmygawd trestle. 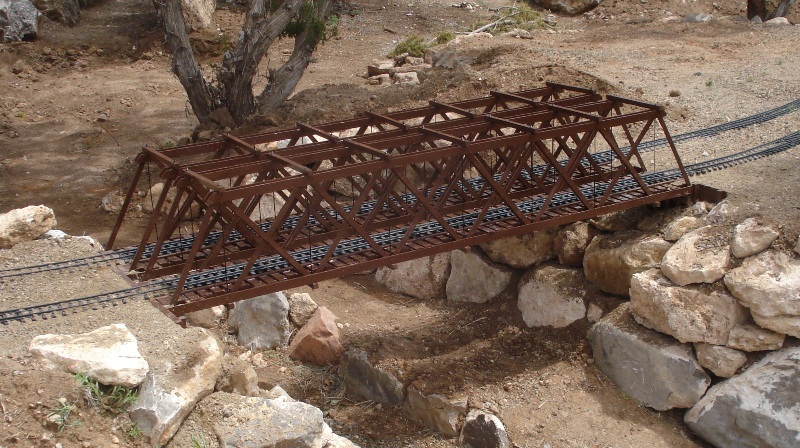 It is made from pieces of several old trestles. I had to rebuild most of the sections as some of the wooden sway braces and bents had rotted away. Several new bents had to be built to fill in the spaces where the sections join together. At the top is the bridge which for now is a piece of 2X4. I am not sure what kind of bridge this will be but I am leaning toward a Whipple through truss. I would like to have as many types of bridges represented on the layout as possible. To support the bridge I built an all new support. The other end of the bridge will have an abutment built into the side of the mountain. Cribs: Along with corduroy ROW the timber crib or pigpen trestle is probably the most expedient way of using logs to lay track. 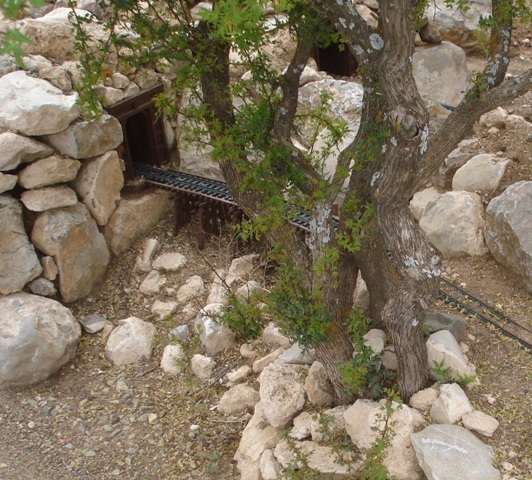 These constructions were made from felled trees held together with braces and a few iron spikes. 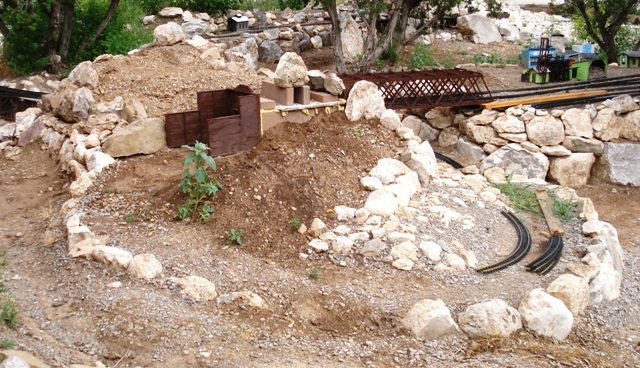 I plan on installing one next to the Cibola Arroyo where the branch-line crosses under the main. This one is made from juniper branches cut here in my yard. It is held together by ribbed panel and pin nails. The sub-road bed next to Cibola arroyo is mostly gravel and sand so I hope it will stay very dry giving it many years of life. If you are up to date on the AMC television series “Hell on Wheels” you know that the season ended with the Union Pacific’s transcontinental railroad construction having reached the summit of the Laramie Mountains at Sherman, Wyoming. Mr. Durant was rightfully justified in celebrating the accomplishment. I can commiserate with the difficulties of the job and go him one further by pointing out that he did not have to first build his mountain before conquering it. Here on the Cibola, North Mountain is vexing me. High temperatures and hard soil have conspired to slow construction to all but a complete stop. Oh what I would give for 3000 1/20.3 miniature railroad workers to complete the job. I will defer to the diary of Michael Cahill, second generation of the Cibola’s founders and builder of the branch-line, as adequate description of my feelings on the project…. “July 18th, 1901 – This morning I rode with Mr. Cope out to view the cut leading to the base of North Mountain. It sat in the gloom of pre-dawn sunrise like some primordial creature brooding in deep thought. It was here 100, 000 years before the first man came and set foot on its slopes, it will be here 100,000 years after the last man leaves. I am quite sure that it cares nothing for the follies of our efforts, those being but a pin dot in its life. 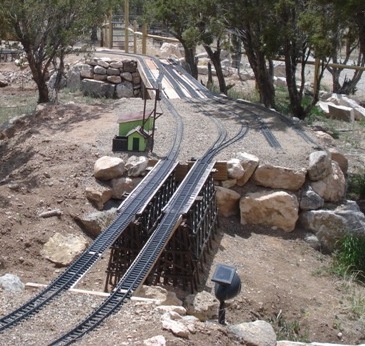 Hopefully construction on North Mountain will conclude in the next week and I can shift to the other end of the layout where the pieces of Ohmygawd trestle are waiting for their turn to inflict misery and frustration on me. The year of track is starting to get very long. With the bulk of the work on North Mountain now behind me I am happy to start on something that involves very little dirt or rocks. The trestle is the other loop on the branch-line returning trains to the height of the loading table. I am spoiled for space on this end and will be keeping the grade to 1%, or perhaps slightly more. This will give my engines an easier climb than the roller-coaster run down North Mountain. 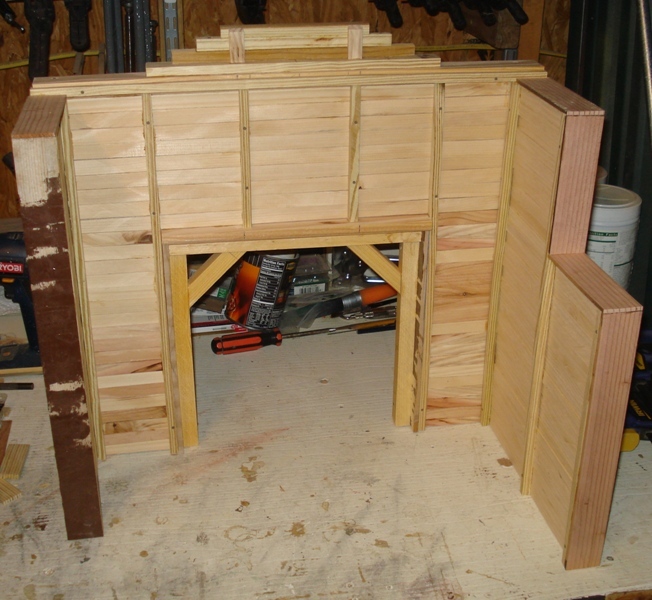 The trestle is made primarily of used pieces from Rolfe Black’s layout. A large amount of repair is needed. Joints re-glued, pin nails replaced and many new girts being required. I have also had to make a few new bents to join the trestle sections into one length. Because the line exits the mountain at an angle I will have to build pilings for the north end of the bridge that are fitted to the rock face. No easy jig work on this one. I have not done this before so there could be several opportunities for me to use my new curse words. I should get in a little practice so as to be at my best. The largest new construction is the pilings and Warren pony truss bridge that allows the road to Broken Wheel to pass underneath. I have also built the piling for the south end of the bridge where the line crosses back over itself. I am still thinking this will be a Whipple through truss bridge. They were not very common in general and as far as I know never used west of the Mississippi river. Good thing I am not a rigid conformist to historical detail. Preparation for East Mountain tour has gobbled up most of my time this month but I expect things to take a great leap forward in September. Saw blades are sharp, pin-nailer is loaded and lumber is on hand. What could possibly go wrong? It is official. The year of track is a failure by any measurement for one irrefutable reason. Not a single inch of new track was laid. Great plans were envisioned, lots of dirt and rocks were moved, a few trees and shrubs were planted and four tunnel portals along with seven bridges were built, but not a single inch of new track joined the right of way. It is a bitter pill to swallow for the Cibola track crews. I seriously underestimated the amount of work required to prepare the base and roadbed while overestimating my ability to move and place all of it. It may not seem like much from the pictures, but remember it was all done with a shovel and wheelbarrow. 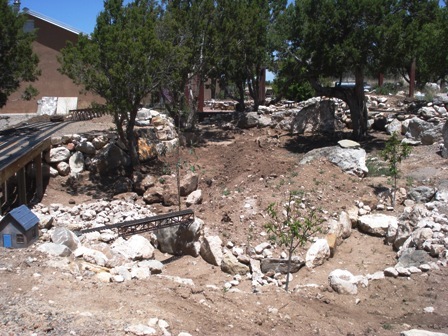 My layout has not had the benefit of a bobcat since the first year of construction when the large boulders were brought in to form the base of the mountains. On a side note I have learned that the machine deficit cannot be offset by flexoril and ibuprofen. I had hoped that concentrating all my efforts on completing the track laying would springboard me next year into all of the things I love about garden railroading. With a large pile of track waiting for installation still sitting in my garage I will have to modify my expectations for 2016. One thing for sure, it will not be the year of track part 2. I cannot stand the thought of dedicating another year exclusively to a task I loathe. Right now 2016 looks like the spring will be spent finishing any dirt work required. The soil will be soft by then and hopefully I can get it done before the temps go up and my enthuse-o-meter pegs out in the red zone. The track laying itself will have to wait until the mood strikes me, but I suspect it will not happen before September. Until then I will enjoy building structures, painting vehicles and kit-bashing the four truck shay. My last major achievement for this year was the long awaited replacement of the low trestle at Broken Wheel. It was removed at the first of November and the double track bridge group installed. I have rolled my caboose over it to check for clearance but no full train has crossed it yet. I think I will leave that for the next “closed house” run day and allow whoever shows up first with a drag of at least five cars to have the honor. Full build logs with many more pictures for all of these items are posted in the specific track features section. Thanks for following along everyone. Sorry the Year of Track did not turn out as planned.